Triumph Tulips are the largest group of Tulips, and are a cross between Single Early Tulips and Later Flowering Varieties. So really they are a mid season type. They are highly regarded as being very strong growing, they have stronger stems than many others and are tall growing to 40 – 60 cms in height. It is this tall strong habit that also makes them excellent as cut flowers. Now it may seem a little technical, Triumph Tulips are Class 3 tulips and are actually the most important group of all of the tulips. Many different colours from white through to deep purple. Classic ‘tulip shaped flowers’ and they are tolerant of bad weather, which in spring can knock down other varieties. 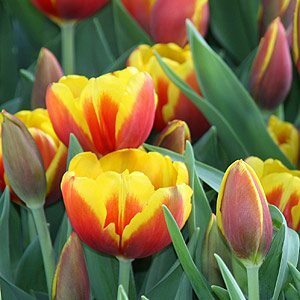 So varieties such as Triumph tulip ‘Strong Gold’ (pictured) are popular both in the garden and as cut flowers. ‘Kees Nelis’ is very similar in tones. Triumph tulips are also great cut flowers, with perhaps the longest vase life of any of the tulips, in fact if you buy a bunch of tulips as cut flowers they are probably the type. With a tall upright growth habit many are vigorous performers. They have the ‘classic tulip shape’ and are strong growing with stems that have strength to make then a great cut flower. A tulip that does well in the front of the garden border. Triumph Tulips come in a wide range of colours and are also widely used for ‘forcing’ indoors. Synaeda Show – White with violet purple blush, an intriguing variety.